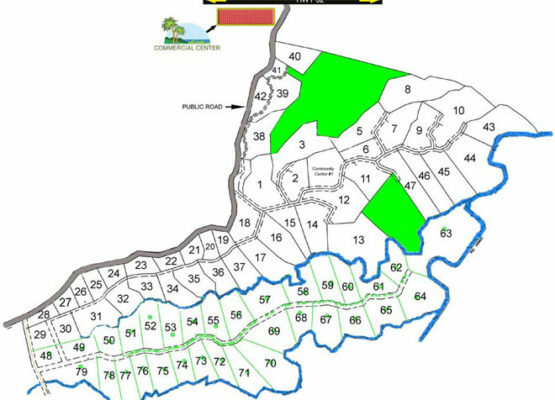 Lot 65 is a premium elevated lot in Grand View Estates, a gated community, providing an easy building site where you can enjoy distant views of the Caribbean Sea. The lot provides electric and water. Mature trees are present and we have a creek flowing at the property line. Beautiful Caribbean beaches and Port of Limon are just 30 minutes from Grand View Estates, highlights of the area are Volcan Irazu and the Tortuguero/ turtle National Park. Lot 65 is a premium elevated lot in Grand View Estates, a gated community, providing an easy building site where you can enjoy distant views of the Caribbean Sea. The lot provides electric and water. Mature trees are present and there is a creek flowing at the property line. Beautiful Caribbean beaches and Port of Limon are just 30 minutes from Grand View Estates, highlights of the area are Volcan Irazu and the Tortuguero/ turtle National Park. The property is located only 1.5 hours East from San Jose on the main HWY (32) to Siquirres in a city called Cimarrones, 13 kilometers east of Siquirres, conveniently 30 minutes from the beautiful white sandy beaches of the Caribbean and the Limon International airport. The development name is Grand View Estates. The lots are all within this development. Costa Rica Real Estate The house is located about a 25 minute drive from the international airport in Liberia. This house is close to all the action but you would never know it while you are sitting around your swimming pool. It is set back from the bustle of Coco in a quiet valley inside a private community with 24/7 on site security. The development also offers miles of trails where monkeys, sloths, iguanas, and a wide variety of birds can be found. The house is located about a 25 minute drive from the international airport in Liberia. This house is close to all the action but you would never know it while you are sitting around your swimming pool. It is set back from the bustle of Coco in a quiet valley inside a private community with 24/7 on site security. The development also offers miles of trails where monkeys, sloths, iguanas, and a wide variety of birds can be found.